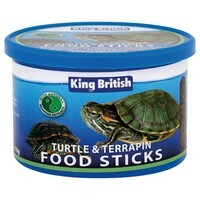 King British Turtle and Terrapin Food Sticks have been expertly formulated to meet the specific nutritional requirements of pet turtles and terrapins. These sticks are packed with the essential vitamins and minerals these animals need for a healthy lifestyle; they even float to support the natural feeding behaviour of turtles and terrapins. The added calcium maintains a healthy shell, whilst the Spirulina algae and shrimp revitalise natural colouring.